This starfish is distinctive in having its five arms connected by webs of tissue. It is a well-known species due to its very distinctive appearance. It lives on sand or gravel seabeds mostly offshore and is widespread in UK waters. May live for several years but little is known about the biology of this species. It is a very thin, leaf-like, flat starfish with short webbed arms. The dorsal surface has a granular texture of small plates. The colour is white with five radiating red lines, one down the centre of each arm. The centre of the disc is red and there are red margins to the arms. The red colouration may be more developed in some individuals and may cover most of the dorsal surface. It is up to 20cm across and is known to feed on small crustaceans, crabs and hermit crabs. It is unlikely to be mistaken for any other species. This species is likely to be seen only by divers. 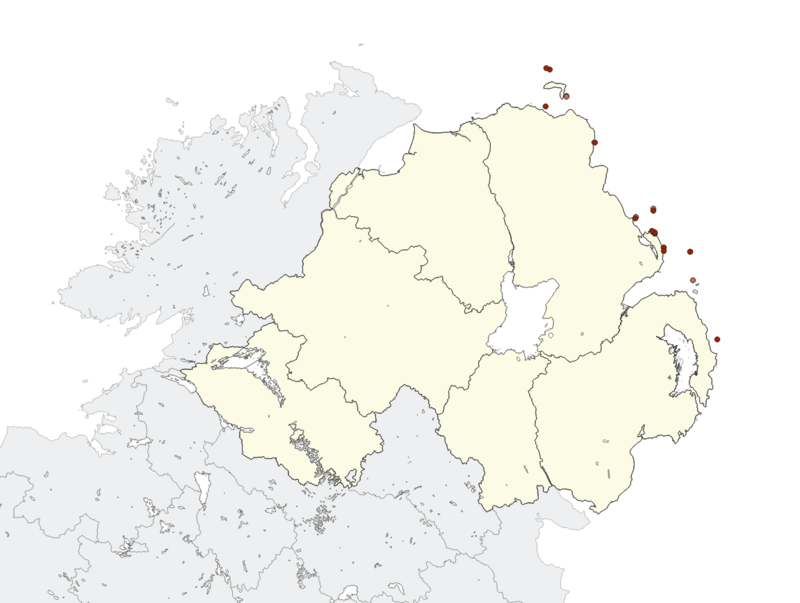 The most likely sites are in the vicinity of Larne or the east coast of Rathlin Island on the Antrim coast. Scattered records are known from the coasts of Counties Down and Antrim and it is not uncommon in the Irish Sea. This species seem to be quite rare in Northern Ireland and normally only single individuals are seen at irregular intervals. It appears to be declining. Rare — confined to a small population of one or two sites in Northern Ireland with Northern Ireland being a stronghold consisting of over half the Irish population. This species lives in areas subject to bottom fishing for scallops and flatfish. It is vulnerable to damage by fishing gear. Implementation of the Northern Ireland Habitat Action Plan for Sublittoral Sands and Gravels. Establish appropriate management on suitable historical sites. Probably most likely to be seen by fishermen and fisheries scientists looking at discards. Any new populations of this species should be notified to CEDaR, National Museums Northern Ireland, 153 Bangor Road, Cultra, Co. Down, BT18 0EU. Tel: 028 9039 5257, cedar.info [at] nmni.com. Divers are encouraged to record species and habitats through involvement with the Seasearch programme which has a Northern Ireland co-ordinator.